I am a composer and musician with a passion for working creatively with others. I work mainly with theatre productions and vocalists, but also with dance companies, choirs, festivals, community groups, film-makers and instrumental ensembles. I compose in a variety of styles, from folk to orchestral to electronic, writing both instrumental music and songs (including lyrics). I sometimes perform live on piano or guitar in theatre productions and with choirs and singers at venues across London and beyond. Have a listen to some of my music or check out some scores to get a better idea of what I do. 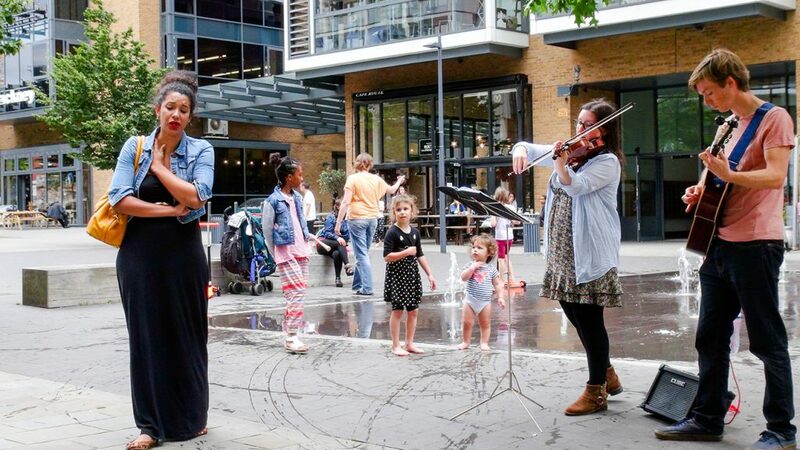 I recently wrote the libretto and music for a new promenade opera, Drifting Dragons, performed around various high streets in South London and also at Arcola Theatre’s Grimeborn opera festival. Earlier this year I created an audio tour of Treorchy, South Wales, with Theatr Iolo, and I worked with Soho Theatre on their fantastic Soho Young Playwrights project. I created the music and sound design for You, Me and Everything Else by Camisado Club which toured across the UK in 2015/16. I was Resident Composer at Soho Theatre throughout 2014, after winning the Cameron Mackintosh Resident Composer Award. My work at Soho included composing for and performing in I Kiss Your Heart with Grammy Award-winning singer Lady Rizo. I was a finalist in the 2015 RSC songwriting competition and have recently composed music for Baseless Fabric, Camisado Club, Whispering Beasts, Theatre Uncut and Look Left Look Right. I graduated from Kingston University in 2010 with an MMus in Composing for Film and TV and a BMus (Hons) in Music Technology, First Class. I’m always interested to discuss ideas and collaborations, so do get in touch.